I seem to have completely forgotten to blog about the new May’15 Challenge that is in full swing on the Altenew Blog. Tasnim has once again invited me to contribute and I was happy to pull out a pretty picture from one of our vacations in Tunisia and use it as an inspiration piece for my project (please hop over to the Altenew Blog to see it). 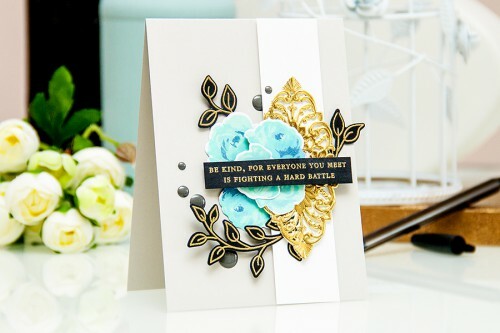 I created a simple project using a beautiful grey + blue + aqua + gold color palette. Be sure to check out our challenge and join in on all the fun – make a card or two using at least one stamp from Altenew for your chance to win a gift certificate to the Altenew store. 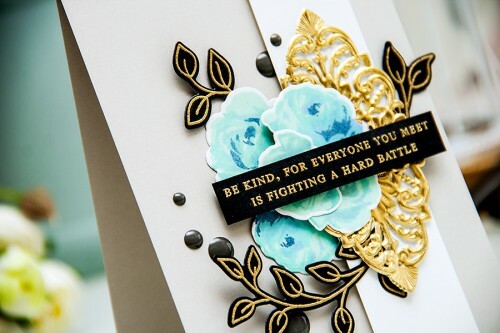 I used a light grey cardstock for the card base, layered a panel of white cardstock on top, added several stamped and cut roses and branches and completed the card with a stunning antique trim element in gold, thoughtful sentiment and a few dark grey enamel dots.